You're not alone soldier, not anymore. Electronic Arts offers the action title that redefines strategic two-man cooperative play when it launches on the Xbox360 videogame system from Microsoft. 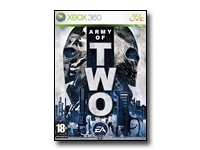 Army of Two throws gamers into hot spots ripped from current day headlines where they utilize unique two-man strategies and tactics while seamlessly transitioning between playing with intelligent Partner AI (PAI) and a live player. When one man is not enough, it will take an army of two to fight through war, political turmoil and a conspiracy so vast it threatens the entire world.